The Upper Orcia Valley (Southern Tuscany, Italy) is a key site for the comprehension of denudation processes typically acting in Mediterranean badlands (calanchi) areas, thanks to the availability of long-lasting erosion monitoring datasets and the rapidity of erosion processes development. These features make the area suitable as an open-air laboratory for the study of badlands dynamic and changes in geoheritage due to erosion (i.e. active geomorphosites). 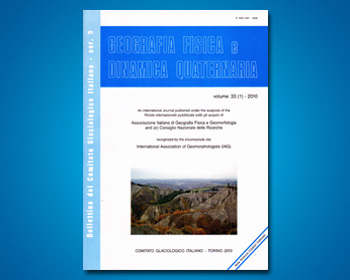 Decadal multitemporal investigations on the erosion rates and on the geomorphological dynamics of the study area allowed to highlight a decrease in the average water erosion rates during the last 60 years. More in detail, a reduction of bare land and, consequently, of erosion processes effectiveness and a contemporary increasing frequency of mass wasting events were recorded. These trends can be partly related to the land cover changes occurred in the study area from the 1950s onwards, which consist of a significant increase of reforestation practices and important other forms of human impacts on slopes, mainly land levelling for agricultural exploitation. In order to better identify the most significant phases of geomorphological instability occurred in this area during the last decades, an integrated approach based on multitemporal geomorphological mapping and dendrogeomorphological analysis on specimen of Pinus nigra Arn. was used. In detail, trees colonizing a denudation slope located in the surrounding of the Radicofani town (Tuscany, Italy) and characterized by calanchi and shallow mass movements deposits, were analyzed for the 1985-2012 time period. The analysis of the growth anomaly indexes and of compression wood allowed to determine a spatio-temporal differentiation along the slope and respect to an undisturbed reference site. The negative anomaly index results to be more pronounced in the trees located on the investigated slope with respect to the ones sampled in a non-disturbed area. Compression wood characterizes trees on slope sectors mainly affected by runoff and/or mass movements with a different persistence. Erosion rates were finally calculated through dendrogeomorphological analysis on tree roots exposure (0.31-3 cm/y, runoff prevailing; 5.86-27.5 cm/y, mass movements prevailing). Dendrogeomorphological results are in accordance with those obtained in the investigated areas with multitemporal photogrammetric and geomorphologic analyses.